First things first. 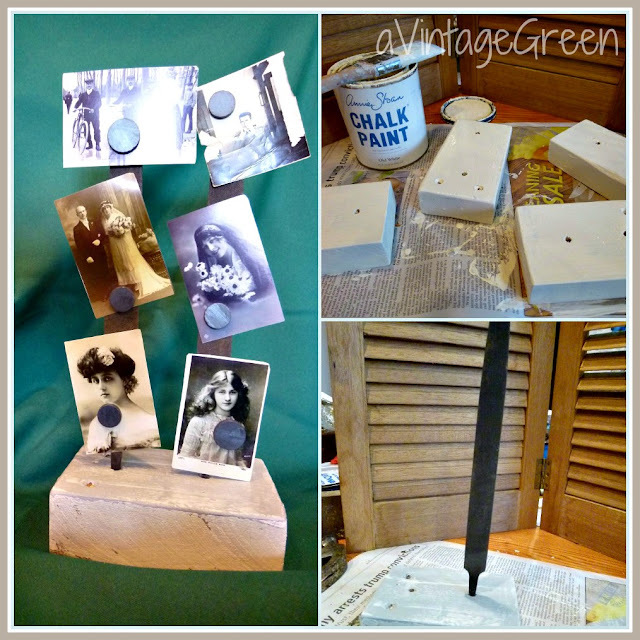 Jane of Mamie Jane's put together a unique photo display, please see her post: Repurposed Metal File Tool. I totally fell in love with her project. Below, my copycat of Jane's project. I found a box of used files at an estate sale. Looked in my box of misc supplies and found a pack of round magnets. Couldn't find any old photos so went to Karen's Graphics Fairy blog and printed out a few different old portraits. Picked a few pieces of 2x4 out of my scrap file, (painted, waxed, sanded a bit the wood with Paris Grey and dry brushed Old White (Annie Sloan) and drilled a few holes). Pounded the handle end of the files into the wood. Added the pictures and magnet. Done deal. See my original post on the file Photo Holders here. Linking with: Debbiedoo's Copy Cat Challenge. I added this post because I love Debbiedoo's blog and occasionally she has open linky parties on specific topics (usually she hosts newbie parties). Also linking with Bunny Jean - this is her 50th Linky Party. Congratulations Bunny Jean. Its also a pleasure to link with Judy at DIY by Design. Joining in with Nutmeg Place, a new party for me. NICE!! You always make me think......"I could do this!!" Sometimes I actually DO!! You did great! Have I told you that I love your blog banner? Love it! It looks great. Thanks for sharing at the All Star Block Party. WOW that is really neat. Jane does fabulous work, so you copied off a good one. She will be flattered. I am so happy you joined in on the fun..thanks so much for joining me! This is a very cute idea! :D LOVE your copycat. Excellent interesting photo display you made after seeing Mamie Jane's. Hi Joy ... love the file photo display. I copied Mamie Jane's too. She has never-ending fab craft ideas. You did a great copy.